Dr. James Robinson intended to live in Baton Rouge for only one year. He and his late wife, Winifred, made the move in 1955 after he received an offer to work at LSU. The couple quickly fell in love with the warm climate, a welcome change from their cold, rainy home in England. They felt it—not just the weather, but also the community and excellence of LSU. After his one year at LSU, James left to work as a chemist at Standard Oil. He has lived in his house on the university lakes since. 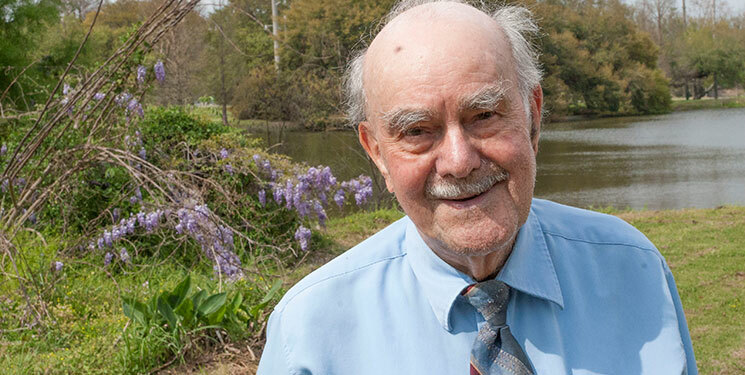 James eventually returned to teach chemistry and instrumental analysis at LSU, where he was able to achieve many of his career accomplishments, including writing the first textbook on instrumental analysis; researching acid rain; and lecturing worldwide. The Robinsons’ giving history with LSU began when the couple, both music lovers and pianists, became involved with Patrons of the LSU Opera. James’ contributions have continued with the donation of a Broadwood grand piano (a gift from Winnie shortly after they moved into their home) to the School of Music, and through establishing the Winifred Robinson Memorial Piano Scholarship and the Robinson Graduate Analytical Chemistry Endowed Award. The endowed award, known as the Robinson Award, is given annually to the graduate student deemed by the department’s faculty and dean to be the best future analytical chemist. It is not simply a monetary award, but also one of great prestige. He added that he also supports the School of Music because, “I love music. When I was 17, in the arrogance of youth, I didn’t know whether to go into music or science.” Ultimately, though, he decided to study science because he was not willing to practice the hours necessary for success as a pianist. Winnie, whom James described as a “one-only edition,” is the namesake of the music scholarship. He shared that he fell in love with her the minute he met her, and enjoyed a 65-year-long marriage.